By: Erik Hyrkas on August 23, 2017. Samsung has resurrected the Samsung Galaxy Note and promises it won’t blow up. The new smartphone debuted during Samsung’s live event Wednesday in New York City, with an unforgettable stage projecting images on the walls and the floor. 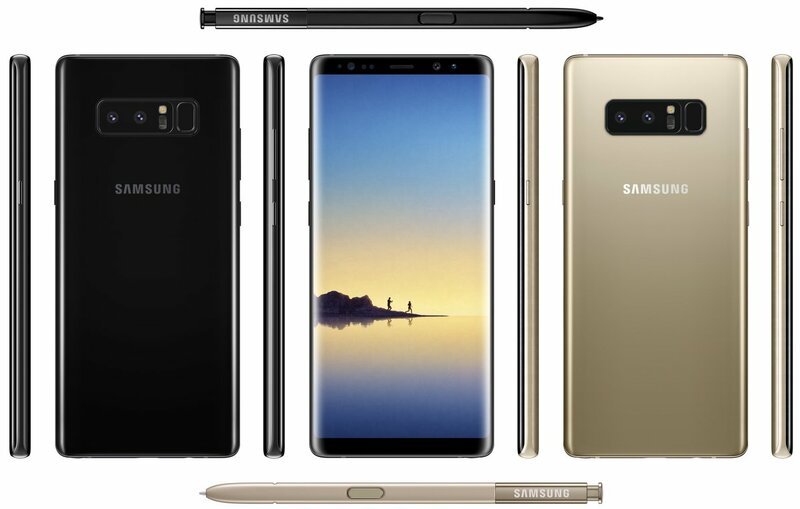 After the ill-fated Note 7 had to be tossed in the bin after the large “battery-gate” scandal of 2016, Samsung is attempting to dust itself off and approach the Note brand again with a new and improved smartphone and stylus (the S Pen). The Galaxy Note 8, while seemingly redundant to the Galaxy S8 Plus, comes at a slightly larger 6.3″ Super AMOLED screen with 2960 x 1440 resolution, a Qualcomm Snapdragon 835 processor, and an astounding range of storage (64, 128, and 256GB) options including a MircoSD slot for more. It also has an incredible 2018-worthy 6GB of RAM. It’s a bit heavier at 195 grams, and it also comes with a new feature–dual 12 megapixel rear cameras. The battery is surprisingly only 3300mAh (smaller than the S8’s 3,500 mAh battery), and it comes with Android 7.1.1 Nougat, IP68 water resistance, iris/fingerprint scanners, and wireless charging. Like the models before it, the Note is a giant rectangle, but the bezels are just as thin as they are on the S8 and S8 Plus models, leaving an incredibly gorgeous piece of glass to wrap the device. This also means the Note 8 uses Samsung’s Apps Edge software features for quick swiping to shortcuts on the right edge of the screen. They’ve also removed the home button, relying on capacitive navigation, leaving a much cleaner look to the device and an improved user interface. The major feature, Samsung’s famed S Pen, allows consumers to jot down notes, edit pictures, and improve their Instagram and Snapchat stories with expert detail. Samsung has also added an ability to make animated GIFs using a “smart select” feature to crop and trim videos, and tools to annotate articles and ebooks, magnify, and translate text. Truly this device has it all, but it also has one of the largest price tags starting around $960. But the real question is, where and when can you get your hands on one? Preorders start on Thursday and phones will be available in retail stores on September 15. Thoughts of your own on the Samsung Galaxy Note 8? Let us know in the comments.